A recently released convict gets caught between corrupt cops and violent bank robbers when he takes a job to provide for his struggling family. There's a moment in S. Craig Zahler's third genre masterwork (see also Bone Tomahawk and Brawl in Cell Block 99 - seriously, go see them now! ), Dragged Across Concrete, in which a car is submerged in a lake as part of an effort to cover up a crime. It's impossible not to think of Norman Bates' apprehension as he watches Marion Crane's car slowly sink into a lake in Psycho. That scene is often cited as an example of Hitchcock's ability to make us care for his villains as much, if not more, than his protagonists. It's cinematic Stockholm Syndrome - spend enough time in the presence of characters we initially find repulsive and we'll eventually grow to side with them. At least, that's the theory. 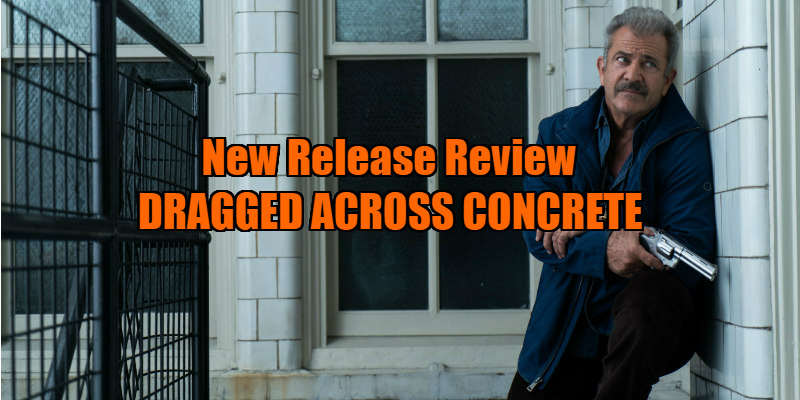 With Dragged Across Concrete, Zahler pushes this idea to the extreme, presenting us with a pair of antagonists in Mel Gibson and Vince Vaughn's bigoted, self-entitled cops Brett Ridgeman and Anthony Lurasetti who make our skin crawl from the off. We spend more time in the company of Ridgeman and Lurasetti than with the closest the film has to a hero, Tory Kittles' ex-con Henry Johns, yet I never found myself succumbing to any variation of Stockholm Syndrome in their presence. Why can the movies make me side with a man who has brutally murdered a woman, but not a pair of cops whose worst infractions are relatively innocent in comparison? Perhaps it's like how I don't remotely wince if someone gets decapitated in a movie, but the sight of a paper cut will have me doubling over in secondary pain. Almost none of us will ever have a run-in with a serial killer, but most of us will have a negative interaction with the police, particularly if, like Johns, you're a black man in America. Rather than worrying what might happen to Ridgeman and Lurasetti, we grow increasingly apprehensive about the collateral damage they might leave in the wake of their actions or inactions. They're the fulcrum of a whirlwind of violence that leaves a pile of victims - some innocent, some deserving of their fate - in its wake. 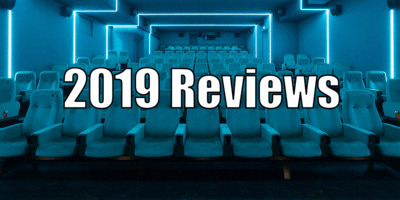 The movie opens with the pair roughing up a Latino drug dealer and sexually harrassing his girlfriend, making racially tinged wisecracks while they go about their work, all before breakfast. When a citizen films their actions on a cellphone, the pair are suspended from duty. Calling on a rich businessman (Udo Kier) who owes him a favour for keeping his son out of jail, Ridgeman is tipped off to a potential heist that's about to take place. With some minor coaxing, Ridgeman convinces Lurasetti to join him in robbing the robbers. Needless to say, nothing goes smoothly. A society that can't trust its police force is a broken society. No matter how rough things may get on the street, the police have to show restraint, otherwise how can criminals be criticised for their actions? When his daughter is soaked by a young black boy who throws a soda over her, Ridgeman grows indignant, conveniently ignoring the fact that the very same morning he administered a similar soaking to the Latina he was harassing. When American movies tackle race, they're too often careful not to offend white viewers, giving us cartoon racists that few audience members can identify with. Not so Zahler, whose latest movie made me more uncomfortable as a white male viewer than possibly any other movie ever has. Dragged Across Concrete is a brutal takedown of white male entitlement and the victim complex of the white Christian American majority. Rather than counting their blessings at merely receiving a suspension for an assault that would see a minority imprisoned for years, Ridgeman and Lurasetti behave as though they're the victims, constantly moaning about how they're being held back in their careers by their refusal to "play the political game." Ridgeman makes a big deal of his daughter's treatment by the black kids in their neighbourhood and his wife's struggles with MS, frequently bringing both up as a means of justifying his descent into crime. Conversely, the African-American Johns, who finds himself part of the team of robbers Ridgeman and Lurasetti are out to screw over, has an equally tough home life - his kid brother confined to a wheelchair and his mother turning tricks to fund her heroin habit - but he never once uses this as an excuse for his criminal activities. In a key moment, Ridgeman and Johns face off; the former repeats his oft-related sob story, while the latter remains silent. White entitlement meets black reality. As awful as Ridgeman and Lurasetti are, they're trumped by the trio of violent white bank robbers who employ Johns and his friend Biscuit (Michael Jai White) as their getaway drivers (in another nod to white privilege, Johns and Biscuit don 'white face' so as not to attract attention from the police). Killing everyone they come across without discrimination, these hoods (led by a chilling Thomas Kretschmann) are the scariest bad guys a movie has presented us with in quite some time. In what almost feels like an act of cruelty, Zahler pauses his story to introduce us to a member of staff at the targeted bank (Jennifer Carpenter), reluctantly returning to work after maternity leave. We watch in terror as she falls victim to a succession of awful men in the space of a morning, and by the end of her arc we want the robbers to suffer a violent demise, even if it does have to be at the hands of a pair of racist cops. The violence in Zahler's films is so shocking that it has the unfortunate side-effect of being the one element that gains the most attention. Like David Lynch - whose Twin Peaks: The Return seems a major influence on the violent, languid, comic absurdist sensibility of Zahler's latest - Zahler is never reluctant to interrupt the flow of his storytelling with a side digression or a moment of comedy amid the darkness. The scenes involving Kretschmann's gang feel like they belong in some as yet unreleased fourth season of Twin Peaks - they're both hilarious and terrifying in that Lynchian way (witness the ridiculously over the top way in which one of them shoots up the convenience store he robs, seemingly just to test out his new gun). Many filmmakers have attempted to ape the style of Lynch - Zahler may be the one who has come closest to pulling it off. Elsewhere Zahler affirms his growing status as the natural successor to such American genre filmmakers as Howard Hawks, John Ford, Sam Fuller, Don Siegel, Sam Peckinpah, Walter Hill and John Carpenter. He shoots action like nobody else working outside Asia, but foremost his movies are character studies. Large swathes of Dragged Across Concrete involve Ridgeman and Lurasetti stuck in their car as they stakeout the gang they've targeted to make themselves rich, and in one glorious moment we're left to watch the latter chow down on an egg salad on rye toast for a couple of minutes. "The best part of a stakeout is the eating," he intones as he wipes literal egg of his face, a foreshadowing of the metaphorical egg he'll find on his face when his male arrogance later backfires. The best part of the great American action movies is simply hanging out with their characters, even if they are nasty pieces of work we can't relate to, and even if they are played by right-wing jerks like John Wayne, Clint Eastwood and, indeed, Mel Gibson. 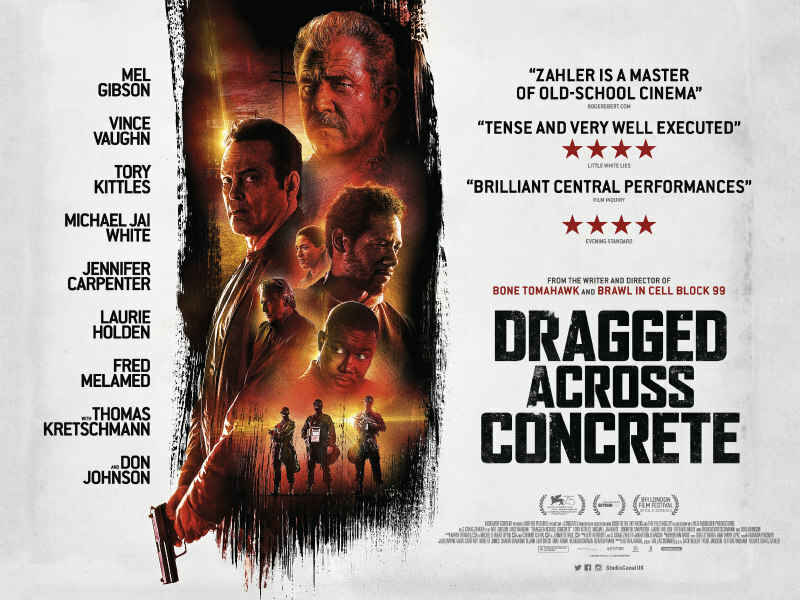 Dragged Across Concrete is in UK/ROI cinemas April 19th.